An examination of relationship and query of the human condition comes to life in a beautiful evocative trifecta of contemporary performances. The Joffrey Ballet closes its 2016-2017 season with Global Visionaries including the world premiere of Joy by Alexander Ekman, alongside the Chicago Premiere of Yuri Possokhov’s The Miraclous Mandarin and the return of Annabelle Lopez Ochoa’s popular Mammtus. Each work compliments the others with elements of love, joy and a return to nature. In Yuri Possokhov’s The Miraclous Mandarin paints the portrayal of a woman forced to act as a decoy for thugs leading to luring a wealthy mandarin to his demise. This honeypot storyline is very reminiscent of classic crime thrillers, such as the 1994 film Rumble in the Bronx, mixing a struggle for power and control with the male gaze. The Chicago Philharmonic, lead by Joffrey Music Director Scott Speck, provides a live accompaniment of Béla Bartók’s 1926 score on stage alongside the company during the performance. A treat to experience creating an intimate moment between dancers, musicians and the audience. Mark Zappone’s costume design is a wonderful collection of revealing 70s-esque male shirts, blood red corsets and studded shorts contrast to a classical appearance of The Mandarin’s brilliant blue tunic. The dancers bring their characters to life in a pantomime of theatrical story telling exemplifying relationship, sexual objectification and violence. Steering away from plot, Victoria Jaiani plays The Woman and stuns with her incredible fluidity and strong performance. Jaiani expresses a strong empathy for her character through tension between sequences and interactions with fellow dancers. Asian influence of costuming, but more importantly extensions of thai chi and classical eastern cultural dance elevates the presence of The Mandarin’s character onstage. Yoshihisa Arai’s flow is full bodied performance of the The Mandarin adds depth and dimension to the work. Visually stunning! 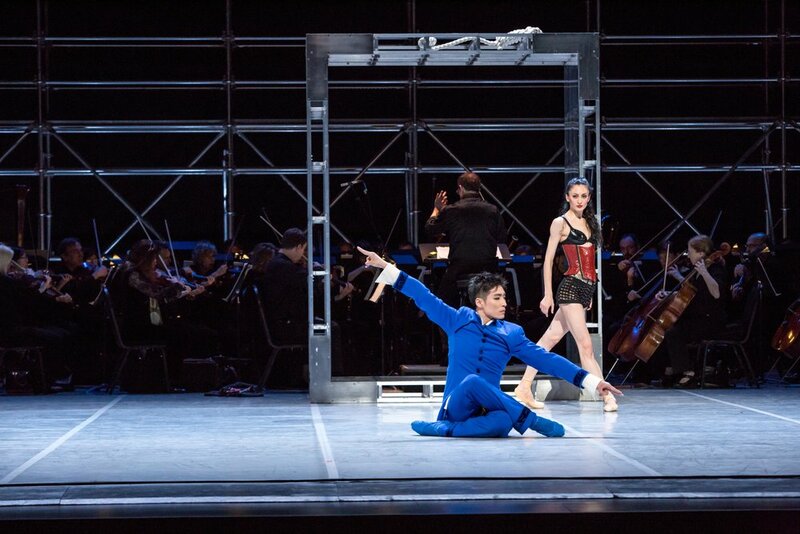 By incorporating a multi-purpose square caged platform and various other props smartly utilized, the story is pushed further into a complex dimension toeing the line between theater and dance - a very encouraging element for any non-ballet aficionados. Shifting gears, the exploration of the human condition with all it’s emotional peaks and valleys is tackled in the very anticipated world premiere of Alexander Ekman’s unique work entitled Joy. This self-aware modern work breaks the fourth wall, exposing the audience in its role as the viewer. A thought provoking and entertaining piece on the concept of joy. Ekman explains his approach to creating this work was extremely collaborative. Working with a large ensemble Ekman’s question “how can we express joy through our movement?” is highlighted through an intermix of solos and duets. The stripped down identities of the dancers by equalizing beige leotards and costuming, personality reigns through the piece and creates a conversation between a collective identity versus a singular identity. A sharp focus is forced from the audience by clean stark lighting and a wide stage allowing the experience of upbeat music and contrasted silent movements to be examined closely. A particularly amusing second movement reveals a hyper sexualized femme form and psyche in a correlation with flamingos and shoes. A fun, high-energy, enjoyable performance with vignettes providing a self-reflection on the concept of joy. A truly intrinsic and fascinating work! Finally, attention must be given to Annabelle Lopez Ochoa’s piece Mammatus as it returns to the stage after its world premiere in September 2015. The performance is nothing short of raw expression. By definition, mammtus is a cloud formation similar to a grouping of lobes clumping together and associated with thunderstorms. The work is a powerhouse of fast paced sequences paired with distinct hand gestures. A blend of animalistic sharp duets and large group segments, it takes a new direction inspired by environment rather than human behavior. A surreal abstract piece that observes nature in a original and organic way. Lopez Ochoa’s close work on the visual design through the combined efforts of Dieuweke Van Reij (Costume and Scenic Design), Mammatus blends the reality of an approaching storm from the human eye’s perspective to the perspective of nature. An auditory experience and key directional lighting choices creates a dark aura while the dancers portray themes of abstract birds or insects making this piece a wonder to behold. From story to concept, The Joffrey Ballet’s closing season the selection of works delivers! The Miraculous Mandarin. Victoria Jaiani and Yoshihisa Arai. Photo by Cheryl Mann. Joy. The Joffrey Ballet. Photo by Cheryl Mann.